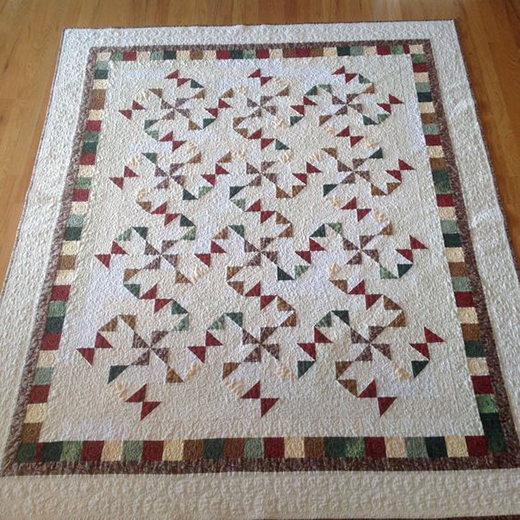 This Oklahoma Twister Quilt Pattern designed By Wendy Russell of Patchwork Square, The Pattern is available for free. "The sample quilts illustrated show the quilt blocks laid out side-by-side. For the quilt on the right, I have added in additional blank squares in various fabrics to enhance the "scrappy" effect of the quilt, and to show off your quilting skills. The quilt on the left shows the blocks laid out with no additional blank blocks. I note an optical illusion in this version. When you see the quilt from afar, it seems to be a stream of patches flowing from one to the next, in a ribbon effect. You may see something different, but all in all this is a fun quilt block to make."